The American lawyer investigating the circumstances in which the 2022 World Cup was awarded to Qatar has urged anyone with information that could prove wrongdoing in the bidding process to share that information as soon as possible. Michael Garcia is a former US attorney for the Southern District of New York and a partner with the New York-based law firm, Kirkland and Ellis LLP. As a Fifa-appointed investigator into corruption in football, he has faced accusations that he is not independent and therefore cannot be expected to work effectively in a role that might find Fifa executives guilty of corruption. 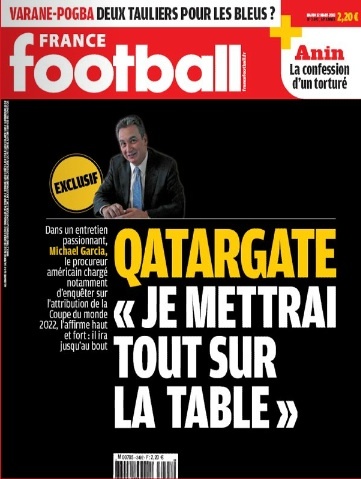 But in a wide-ranging interview with the current issue of France Football (left, or visit their website), undertaken face to face over several hours with two respected FF reporters, Philippe Auclair and Eric Champel, Garcia insists he will go where the evidence takes him – and present his findings in full. Persistent rumours dogged the 2018 and 2022 bidding processes in which Russia and Qatar respectively won the rights to stage the World Cup in those years. Deal-making, vote-swapping and active corruption have been alleged, and always strenuously denied by Qatar, even though, at the very least, some form of collusion between Spain and Qatar has been publicly acknowledged even by Fifa’s president, Sepp Blatter. Blatter acknowledged collusion in the process both before the vote in December 2010, and after that vote. Sportingintelligence understands that Garcia has continued to receive new information about the bidding process, and is aware of whistleblowers and insiders who can give him details about the bidding campaigns. Michael Garcia: There are many other matters under investigation, the one on [vote for the 2018 and 2022] World Cup, which has been referred to me formally. France Football: Formally’, so you’re confirming that? MG: Yes, and it’s all open. That’s the message I’m trying to get across, and I believe that it’s very important. The time has come for people who have information to come to me, I haven’t got any preconceived ideas on what’s happened or what’s not happened. Well [I’m saying to them], ‘if you truly believe it, the moment has come to show yourself. There are things that we can do, under the parameters of the code, that will protect your anonymity’. I will work with them under this report. What wouldn’t be … useful would be that under this wide-ranging inquiry that I’m leading, later, there are people in it who say, ‘well, they got the facts wrong’, when they knew that beforehand. You know something? Tell me! I’m working, working hard to uncover what’s there or isn’t there. [We’ve got] the framework, the channels through which people have got to come if they really think they have something to say. On whatever it might be! On whichever aspect of whichever question related to the World Cup. It is a message that has got to be heard. People have talked, written articles but what you have no is an official body which is in charge of this matter and it’s important that people go see me to tell me what they’ve got [at their disposal]. FF: [With reference to the 2022 World Cup bidding process] have you gathered information, and how much time will that investigation take? MG: Very good question… It’s a drawn out process, and that’s in part to do with what we were talking about earlier. How much information is still out there? How many people will be proactive and come to me? On the other side, have I got to decide to take the time to travel and convince people they’ve got to talk? The subject itself is complex. I believe that it’s a good opportunity for everyone, everyone will do well out of it. I honestly haven’t got any preconceived ideas. As you know when you talk to the people from the  World Cup, they have very firm opinions… or big interests at stake. One or the other. Not me. I haven’t got a single opinion on subjects such as the date when it has got to take place, etc. But I will pay attention to everything, to whatever current opinion might be, and I will examine all the information with the same impartiality, whether it comes from the US, from Qatar, from Russia, from Australia. FF: What are your angles of inquiry? MG: My view remains the same. ‘What happened? Where have there been problems, if any? Have there been Code violations?’ And then also to examine certain subjects that you’ve mentioned in your [France Football] investigation … Were they close [to a breach of the Code]? And is that a problem related to the structure that existed at the time? I think that all these questions are very interesting but the first of my priorities is obviously to determine if there have been, or not, breaches of the Ethics Code by football officials. FF: Could the FIFA Congress which opens on 31 May be an opportunity to give an extra boost [in your inquiry] on the World Cup dossiers? Or is that too early? MG: That’s too early to say. It would be good if we can make it, but it’s too early for me to say that I’m fixing myself a date like that. I hope that significant progress will have been made, of one kind or another. But I haven’t got any idea today where we will be. Or not. But I hope that we will at least have made significant progress on the direction [we’re taking], that there will be a crystallisation of specific issues, on which we will be able to concentrate; because we could sit here talking about issues… until the end of the weekend. One part of the work of a good investigative journalist, or of an investigator is, yes, to have all the facts in mind, but also to know where you would like to go. To know what you’ve got to do to get there. Whatever the date. When I have encountered problems of this kind before, it’s because of [the impossibility of] doing that. Because then, you’re constantly looking at the terrain without breaking it down, and that’s terribly ineffective. I hope that with this ‘funnel’ for [new] information [Garcia is referring to the whistleblower line] I truly hope that we can do this work on the mapping. FF: There are people who have called into question your independence at Fifa. Are you truly independent? MG: Yes. And that’s very interesting. I hear the criticism: ‘How can you be independent when you are paid by Fifa?’ Well, that’s not such an unusual thing as all that in the US. In the US, when a business has problems, we call for an external audit, generally under an agreement passed by the government. This auditor will be completely independent and, generally will submit his report to the government — but he’ll be paid by the business! My connection with Fifa is the same as an [external] administrator’s would be. I use them from time to time to get messages out, or when I can have access to the original [documents] in an investigation, or when I need to reimburse the expenses of an investigator or a lawyer. But there is no supervision of what I do. I am really independent of this organisation. I think that it’s not such a strange relationship as all that, because there are a bunch of cases of this type [in the US]. FF: But where’s Sepp Blatter in all this? Does he want to hear what you have to say on Qatar, on Russia? MG: I don’t deal directly with Mr Blatter. I do not submit him my reports. He doesn’t speak to me about my work. I couldn’t tell you anything, in one sense or another, on these subjects because we haven’t got this kind of interaction. He’s kept himself outside of my ‘sphere’. He is the president of Fifa, he does what he does. I have met him perhaps… once in the three months of my mission. FF: And if you have concrete information to communicate on the award of the 2006, 2018 and 2022 World Cups to Germany, Russia or Qatar, you will put that on the table? FF: Without the slightest hesitation? MG: Absolutely. I will put what I have, or what I don’t have , on the table, all right? It’s not like I’ve had this idea, ‘’that’s what happened’. Whatever I find, I will put it all on the table , all that what we find, and what we haven’t found. And I believe that it’s in everyone’s interest. A fair look. Hard, but fair. By listening to everyone, and by making a fair evaluation. FF: Is it possible to imagine that with the information you have uncovered, the 2022 World Cup won’t take place in Qatar? MG: I know everyone is interested in that. But I believe, and I believe that Judge Eckert would say the same thing, that our jurisdiction is limited to people. The only thing that we can do is to say, ‘You, football official, have violated this clause of the Ethics Code and you, football official, are going to be punished by this sanction’. It is only about people. That what we can do, OK? Decisions, on the site of the World Cup, you know, that’s beyond the jurisdiction of the Ethics Commission. That’s a completely different process.